Peeled and deveined shrimp are marinated in a sriracha-lime blend along with grapeseed oil. (Grapeseed oil has a high smoke point that is perfect for grilling.) They are simply seasoned with kosher salt and served in warm corn tortillas. Fill with cotija cheese, sliced avocado or fresh cilantro to really make these tacos pop. When you offer everyone their favorite toppings and fixings, everyone is full and happy at dinnertime! It is a gluten-free meal that is also great for entertaining! Substitute your favorite hot sauce for the sriracha - Cholula is a favorite! If spice isn't your thing, just add more citrus. Additional lime, lemon or orange all taste great. Per Serving: 304 calories; 10g fat; 24.1g carbohydrates; 29g protein; 239mg cholesterol; 1463mg sodium. Great recipe with some great taste. I would certainly add either guacamole or some sort of salsa to the tacos to complete the taste. Since I am from Mexico I must always have salsa on my tacos. Would certainly recommend a pineapple or a tamarind salsa with these. Very quick and tasty recipe to whip up for lunch or dinner. Love to make this with the addition of picked red onions and cotija. Make sure to add avocado for that extra layer of creaminess needed in this dish. these shrimp are SO tasty on their own - i actually just served them over rice with black beans and avocado! the sriracha makes them so delicious with hardly any work. Very delishious with mahi mahi! I made this for lunch with guacamole, red onion, and cilantro and will probably make it again next week. So easy and insanely tasty! 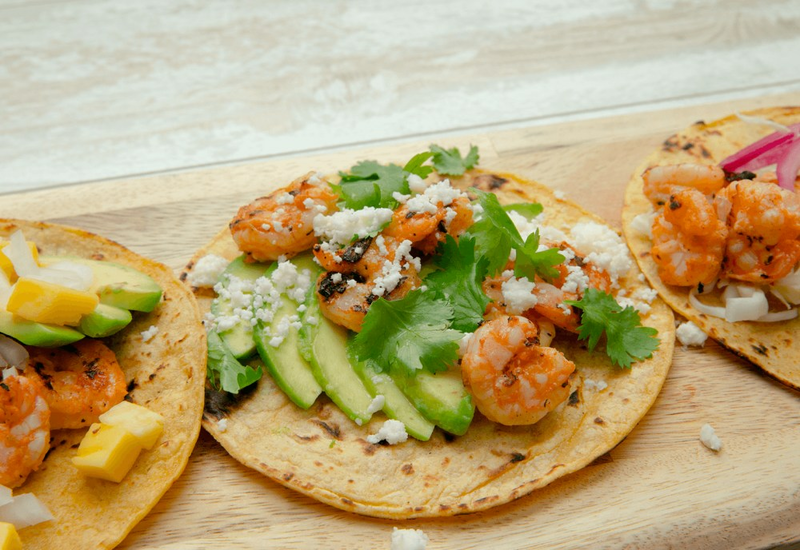 A good recipe for grilled shrimp but as a taco this needed more. Please add more Salsa recipes to your site. These would have been great with a spicy fresh tomatillo salsa.